We are back this year to support the Race Around Ireland, one of the world’s most famous cycling challenges. It is 2100kms, which you need to finish within 5 and a half days – sleep is for the week and it loses you time. This year the race was overbooked and the 2016 race is already nearly booked up. 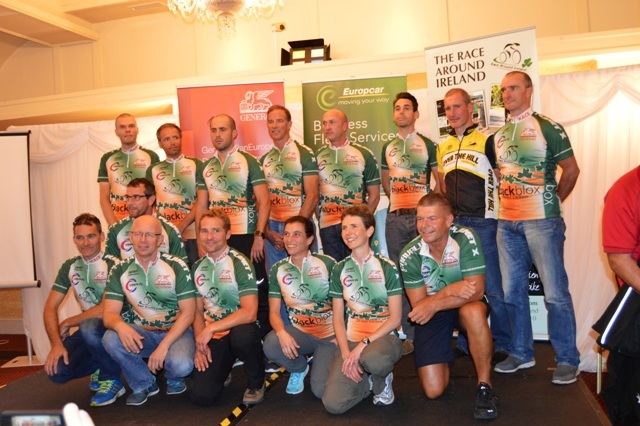 We made the custom cycling jerseys for the race and here you can see the solo competitors at the start presentation, trying to hide their fear with a carefree grin – it doesn’t fool us though. 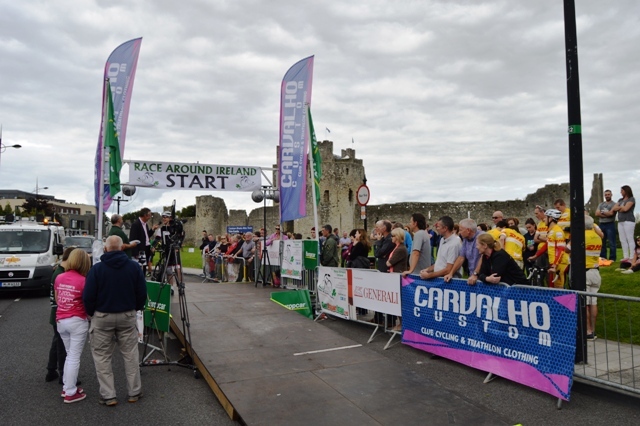 The race starts in Trim in front of the castle and also serves as a qualification for the big daddy of endurance cycling racing, the Race Across America. 10 years ago, cycling was for the most part a gritty unglamorous sport, all about suffering and camaraderie, whilst triathlon was a minority sport for nutters; equipment tended to be functional and choice was limited. Things could not be more different now, with all sorts of premium brands bringing some bling to the market and a seemingly never-ending choice of exotic equipment available, be it bikes, clothing, electronics, drinks, nutrition, training regimes and so on. Sometimes it is easy to get lost among the glamour of the big brands that spend millions on advertising and sponsor the top teams and athletes; meanwhile, there are a few companies like Carvalho Custom that have eschewed the bright lights and kept plugging away focusing on producing pro quality kit but without the astronomical price tags. We have managed to keep our feet planted firmly on the grand and have never spent any money on marketing campaigns, instead relying on word-of-mouth and generally keeping our costs down to a minimum (for example by selling direct from Portugal to the world, rather than having regional distributors). It means that we can pass on these savings to our customers, so our prices are very attractive for the quality that we supply. Having said all this, the bad news is that because of the increase in our costs of raw materials as we have upgraded many aspects of the kit we supply, we are making our first price increase for 3 years (an increase of around 5%). The good news is that if you are buying from the UK, then the 20% decrease in the value of the Euro against the Pound over the last 6 months or so means that our kit will be a lot cheaper for you! We are not going to apologize for putting our prices up because we still believe that we are the most competitively priced supplier of high end kit. So if you are after a glamour brand on your custom cycling jerseys or club tri suits, then we are probably not for you; but if you want the best value-for-money available for top end kit and a team that is truly dedicated to customer service then perhaps we are the right custom cycling & triathlon kit supplier for you. 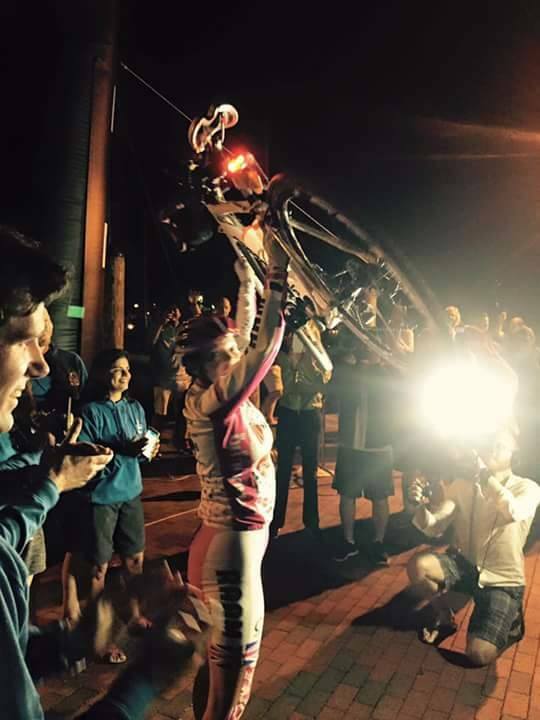 In a heroic effort, Shusannah Pillinger has become the first British woman to complete RAAM, 3000 miles cycling across America in 13 days. Averaging around 250 miles a day and sleeping for just an hour or two each day it is truly a superhuman achievement. We were very proud to be her custom cycling kit sponsors – if our chamois was good enough for Shu during her 13 days, then it is pretty much good enough for anyone! 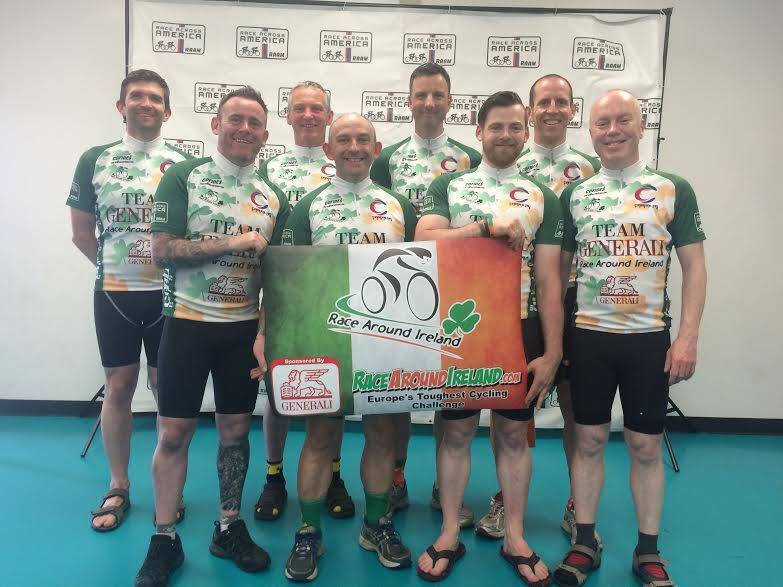 We also supplied the custom cycling jerseys to Generali Race Around Ireland team, who finished RAAM in a very creditable 6 and a half days. The Race Across America is the world’s toughest endurance cycle race – 3000 miles without stopping, to be finished within 12 days. 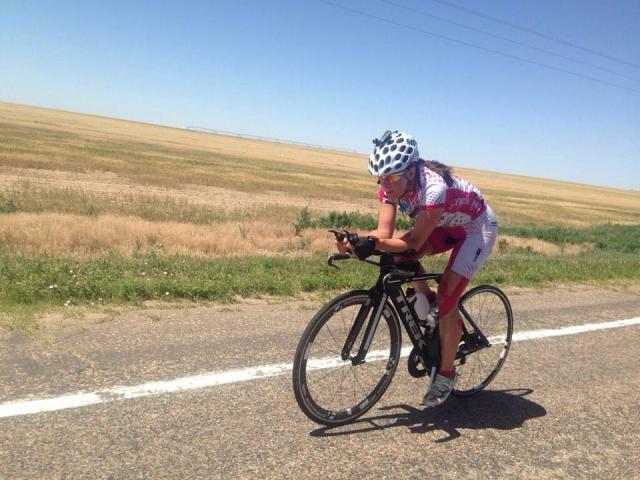 Carvalho Custom sponsors Shusannah Pillinger’s custom cycling clothing, and she has just set off in her attempt to be the first British woman to finish. Last year she made it most of the way, but then fell asleep on her bike and broke her collarbone – I suppose we can forgive her that after spending 9 days riding 300 miles a day on a couple of hours sleep a day….! You can follow the race at http://ridefarther.com/ and via her facebook page. There is also a good BBC article about her attempt here. Best of luck to Shu and please show her your support on social media! We have been getting our head down and doing some more product development here at Carvalho Custom – our latest piece of cutting edge technology is the Carbon Biofit custom cycling jersey. Using carbon fibre threads mixed in with microfibre allows us to have a super lightweight jersey that is still very strong, which makes it very resistant to threads being pulled and general wear and tear; meanwhile it has a very high wicking capacity (so it helps sweat to evaporate from your body), helps to regulate body heat and won’t stick to you when you start to get sweaty. The perfect club cycling jersey has to be lightweight, soft to the touch, not cling to skin, hard-wearing, moisture and heat regulating and have an attractive appearance – we think we have pretty much done it all with this new fabric…. This new jersey will replace our current Bio-Cerâmica fabric, which has been a fantastic product for us, but we think the Carbon Biofit is even better! 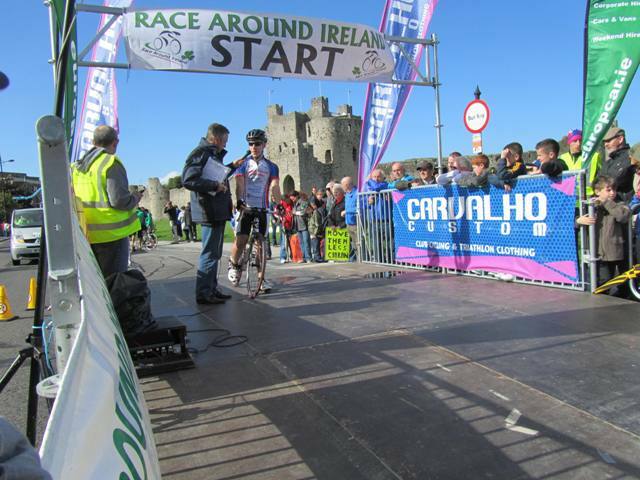 We have been sponsors of the Race Around Ireland for 5 years now and we are back again for 2015. The Race Around Ireland is Europe’s toughest cycle race and the rules are quite simple – there is a 2150 km course and you have to get round as fast as possible and when you sleep you lose time. So it is not for the faint hearted if attempted solo, but you can go in teams of 4 or 8. Such is the popularity of the race that they are now full up for 2015 both teams and solo riders and this year will be the biggest year ever in terms of number of participants; the fun/agony/ starts on the 30th of August in Trim and we will be there to wave the brave souls off. Anyway, best of luck to all the riders taking part and we look forward to meeting you all in August! It is very exciting to see our halterneck cycling shorts, developed by Carvalho Custom (with utility patents pending and design patents granted), going on sale under license to Wiggle and their DHB brand. We spent a lot of time developing this product – as with many of these things, the final result may appear deceptively simple but the road to get there was a long one! We knew that so many female riders were not buying bibs because it is such a hassle to pull them down when nature calls and we knew that there had to be an answer that did not involve zips, clasps or any straps that needed to be removed. Our halterneck designs with the back straps joining under the arm means that in the riding position the shorts are held up at the back as they would be by normal bib shorts, but when a rider gets off the bike and crouches down, the pressure is relieved on the back straps and the shorts can just be pulled down, as if they were non-bib shorts. The back straps also guide the front straps round the side of the chest, so also resolving the problem of straps rubbing on breasts. 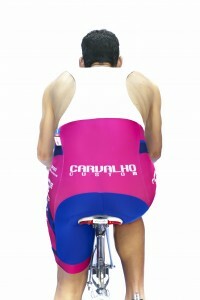 You can buy our custom halterneck bib shorts here. Being based in Portugal has its advantages of course, not least the beautiful weather for us to ride our bikes in. There are also some good things about running a business from Portugal and selling direct into northern Europe and elsewhere in the world – it is one of the lowest cost manufactures in Europe as well as being one of the leading producers of high end sports clothing, with many of the top cycling and tri brands now making their kit in Portugal. This means that we are able to make premium custom cycling and triathlon kit at very reasonable prices, making us one of the most competitively priced suppliers of high end kit in the custom sector. Recently with the bedlam that has been going on in the Eurozone, led by our good friends the Greeks, the value of the Euro has collapsed against the good old British pound. So in the last 6 months, the Euro has fallen from less than 1.20 to the pound to today reaching nearly 1.42. This means that our British clients will be paying around 20% less for their orders now compared to mid 2014. There has been a lot of clothing coming in from China recently also and they have not been able to benefit from this collapse in the value of the Euro, so it means that Portugal is now the place to buy top quality kit at bargain prices! Fall in the value of the euro means UK clients pay 10% less! Yes that’s right, because of all the economic shenanigans going on with Greece and so on, it means that a British pound now buys you more than 1.30 euros, whereas a few months ago, it was less than 1.20. As a custom cycling kit & triathlon kit supplier, we sell directly from Portugal to the UK with no British footprint, so that means we can pass on all these savings to our UK customers. For those of our customers who live in the Eurozone, you will still have access to the most competitively priced pro-quality custom cycling & triathlon kit in Europe, you just won’t get the extra 10% off! You can download our order form and price list from the footer at the bottom of this page. We have just finished trialing our new lycra for our custom tri suits and tri tops – is is a brand new fabric which is super lightweight and very fast drying, with a hydrophobic treatment that causes water to bead off. It is an amazing feeling to almost feel dry as soon as you take your wet suit off! Our new fabric offers the same compression as our existing Power Lycra fabric, but is 30% lighter; it also incorporates a special thread that will prevents any transparency in the fabric even with light colours. We are currently offering our new custom tri suits at the same price as our previous range (€71.90), but we will have to increase the prices shortly – so please get in touch if you would like to go just that little bit faster in your next triathlon (and a little bit drier! ).